Take Those Muddy Glasses Off To Understand That What We See In This Life Is All About Our Perspective! It’s amazing to me how we can be affected by our attitudes and viewpoints in this life and literally smash the blessings in the gift box without ever taking the time to unwrap them to see that it was in actuality a gift all along. It’s like having mud smeared across the front of one spectacles and feeling as though the world is dirty! Just think of all of the opportunities missed and joyful realities unrealized all because of the fear that was smeared across your eyeglasses that kept you in that dead end job or that unfulfilled feeling that comes from that one sided and non ordained relationship. I believe in the concept that one definite reality was laid out for us by our Creator and anything else that WE chose to embark in would have disastrous results and reveal itself to be just one big waste of time and fraudulent to say the least. Sure, all mishaps or selfish indulgences that came into our life out of being to stubborn to submit to divine flow may be considered in hindsight as a learning experience, but if we had only listened to that gentle voice that God whispers in our ear with our lives would have surely been so much different than it has ended up to be today. And while I shared that I believe in one set ordained reality for ourselves, understand that there are those other realities that we have chosen that to us in our ignorance will think is doing just fine. Little did we know that there was greater for us and we just happened to settle for less. We settled for less because we interrupted the divine process too early because we just couldn’t wait out of being carnal. We took that cake out of the oven by our anxious rushed choices too early and now we cannot ice it with the delicious frosting of an accomplishment achieved through long suffering through the process. We have a plate full of half baked dough! How terrible! From this junction point in my life I can truly share with the world that I know for a fact that no matter what you may be going through now, understand that life is long and there may appear to be many roads to chose from yet there is only one. Sure, you can go ahead and not heed the voice inside of you to go off of the path and go into a reality that was never meant to be for you but it is only you who must face the consequences of that choice! You know, these five sense that we possess are so very wonderful yet and still they always seen to get in the way of our ability to perceive what course must be taken through the eyes of the spirit. Our carnality almost always trips us up and we can sometimes go through an entire lifetime before we begin to actually see this. That job that you stayed in for what seemed like a lifetime made you want to kick yourself when you got from below the control of an oppressive boss who made you feel as though he was doing you a favor by “allowing” you to work there when in actuality you were a diamond in the rough that drove his company to record successes and financial profits while you served the organization year after year being glad to receive whatever minimal raise that you were granted. Once you made the move to empower yourself to see your life outside of the box and take a different perspective on what you’ve always know lurked deep inside of you, your life changed immediately and literally overnight because you were bold enough to wipe that mud off of your glasses to see how the world beckoned to you at every turn for that same brilliance put inside of you by your Heavenly Father all along! Fear has been proven to not be from God! How many of us profess the name of Jesus Christ as our Lord and Saviour yet are too fearful and submit to Satan through our actions by seemingly quitting long before our process of growth truly begins? We stay in these dead relationships that in actuality was a reactionary comfort zone that was instantly put together and manifest out of a need to escape the prior disaster that had been our life. I know, I have done this more times than I would like to admit myself so I know what I am talking about and I am going to keep it real and share with you that when in the valley of those major decisions you must be still. Be still and listen over those distracting voices of this world that will pull you into situations that may seem right but were never prescribed to you by your Maker. Don’t be afraid of the unknown and never be afraid of being alone. First of all, you are NEVER alone! You might get a little lonely for some human companionship sometimes but never think that your God has forsaken you, abandoned you or threw you into the junk pile, NEVER THAT! Sometimes what we may think is the quarantined existence of loneliness is merely our Lord removing us from the madness of this world so that we can be better enabled to hear His voice! He would never force Himself on you but sometimes He will have to take you out of the noisy classroom to put you in a quiet room like our teachers did back in the day coming up so that we can truly here what He has to say to us without distraction. Allow your Father to wipe that mud off of your glasses that has been blurring the happiness that He has always had for you but you threw away not knowing that the heavy box that you carried was a load of blessings all along, you just never knew how to unwrap that gift and many of us have tossed it away forever. How sad. Just think of how many of us are merely existed and “enduring” another day in a life that wasn’t even meant for us because WE chose the existence that we are suffering in. Never take the life that you are in if you happen to be in pain because of it as the absolute end all! You must know for a fact that there is better out there for you and to even think about taking your life is what your enemy wants you to do because he doesn’t want you to see the beautiful sun that shines brightly behind the dark and temporary storm clouds over your life that has warm loving and uplifting rays that are destined for you and only you! Hold on and know that if you got this far in life no matter what the circumstances that your God has always “gotten your back” in every situation even when he should have left us to stew in our own juices His mighty hand reached in to pull us out of what would have been a sure doom! Trust in that when faced with an obstacle that seems to be a challenge that we might not surmount, we might not surmount it by ourselves but we WILL overcome it as long as we stay connected to that higher power that is always victorious and has never let us down! Sure, to walk through the door of the unknown can be very unsettling at times but you have to understand that what is now unknown will one day soon be the “known” and merely another invisible mental barrier that you were allowed to conquer once again to bring you to a higher level. You might not see a favorable positioning, opportunity or job where you live now but what if you were to relocate to where things may be better after a little research? The fear that is smeared across your eyeglasses may be the ONLY thing stopping you from that new life that God is pleading for you to move toward. Take off those glasses and see the world for what it really is! This is just one of those mornings where I am writing as I am led to, non directional and flowing because I know that I am a lightning rod to captue a message that someone needed. Hopefully, it will reach its intended destination and I will be overjoyed if and when it does. There were many times where I received confirmation from sources that seemed totally unrelated to what I may have been going through at the time. The message was there but the means of that message being delivered to me was unconventional to say the least. If I had rejected the source I may not have received that life changing word because of my close mindedness to the vastness of God’s creation. You see, He doesn’t speak to us always through a burning bush or merely in a church service. It may come from that babbling drunk who sits begging at curbside not knowing that he is being used for a bigger purpose while his only desire is another hit of booze to self medicate and wash his troubles away. There may divine value in that ramble that he shares. Never close your ears to it. You answer may come from the lyrics of a song that plays in the elevator while you are on your way to that dreaded doctors appointment. You may be so caught up in the serious health news that you are about to hear that you didn’t realize that the song playing in that elevator was the favorite song that you and you mother or grandmother used to enjoy together as a sign of everything turning out alright. 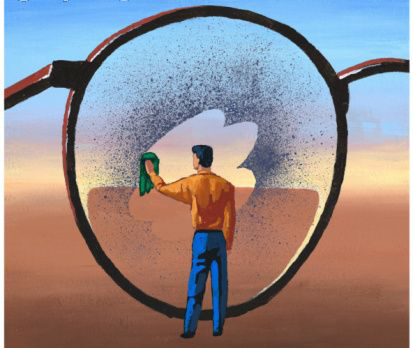 Take those mud smeared glasses off from you face and see the world for the good that it has for you and do not succumb to the “unplugged from righteousness” common mindset of negativity. Miracles just do not happen to someone who doesn’t believe that they will! I know this to be fact and I know this to be true because after all that I have been through in this life, I have been gifted with such a special gift that has always been there waiting for me for a lifetime. What’s for you is for you and if God wants you to have something even our own foolish choices and decisions won’t keep His gift from us! Trust in Him and know that your new reality and overwhelming joy will be only a matter of time before it comes to fruition. 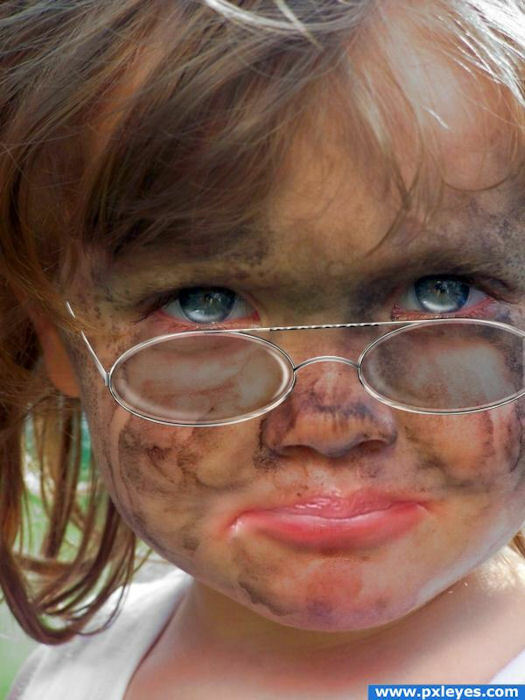 …….first you just have to take off those glasses with the muddy lenses! Previous : The LanceScurv Talk Show – Was The Legacy Of Dr King Just One Big Waste Of Time? Next : The Gantt Report – Martin Luther King Was A Convict!